Who doesn't like a waterfall? Well, this hike has not one but two different cascades, one of which is a two-tiered drop! 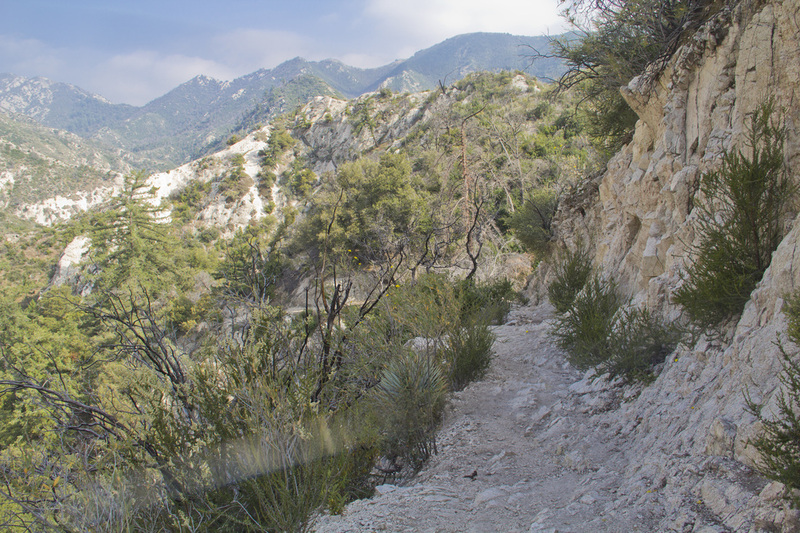 And along the way, hikers are treated to some stunning vistas of the interior San Gabriel Mountains as they pass through a unique bit of Southern California history. Best of all, the trek is mostly completed under a dense canopy of oak and alders on the banks of the Arryo Seco, providing plenty of shade from the blistering California sun. ​The journey begins at the Switzer Picnic Area just off the Angeles Crest Highway, 10 miles northeast of La Cañada Flintridge. Here you will find an ample parking area with numerous picnic tables and grills nestled under large overhanging oaks. 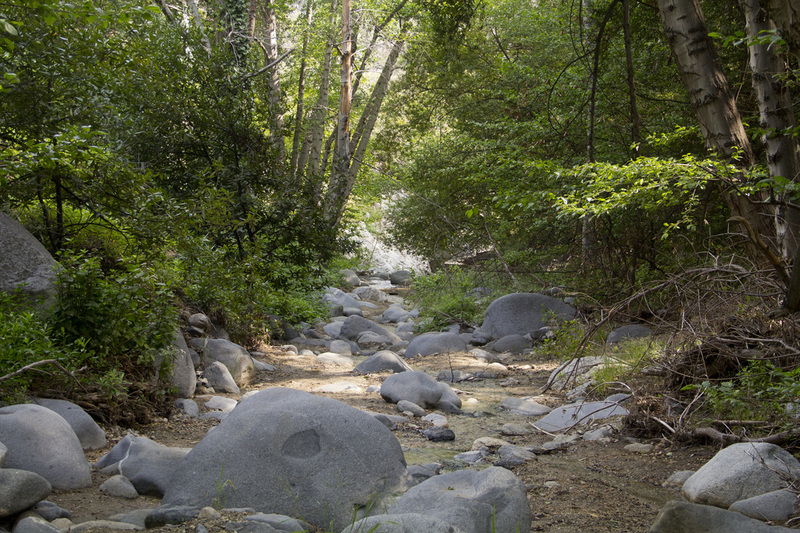 The Arroyo Seco (Spanish for dry stream) babbles lazily nearby, inviting picnickers to dip their toes in the refreshing waters on a hot summer's day. Though there is plenty of parking, the lot can fill up quickly on weekends. Additional parking is available on the Switzer Truck Trail access road and at the entrance of the picnic area on the Angeles Crest Highway. 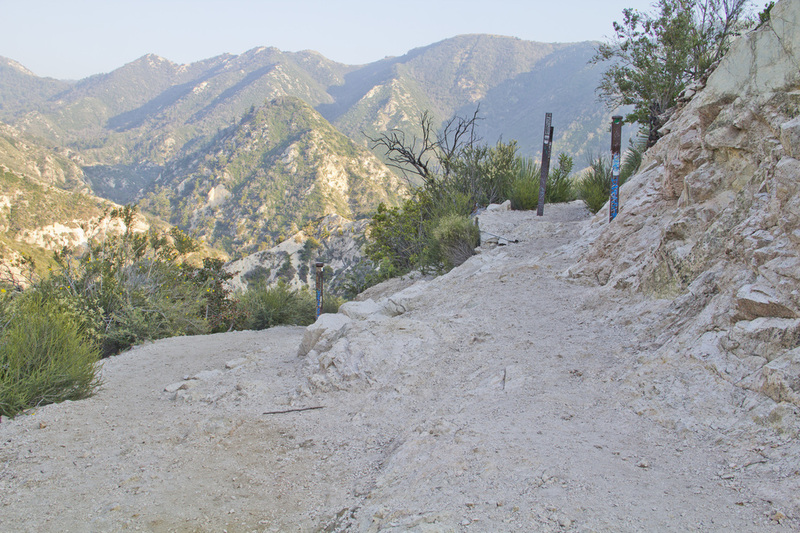 Parking at either location will add extra mileage to your hike with a moderately steep climb from the picnic area to the Angeles Crest Highway parking lot. 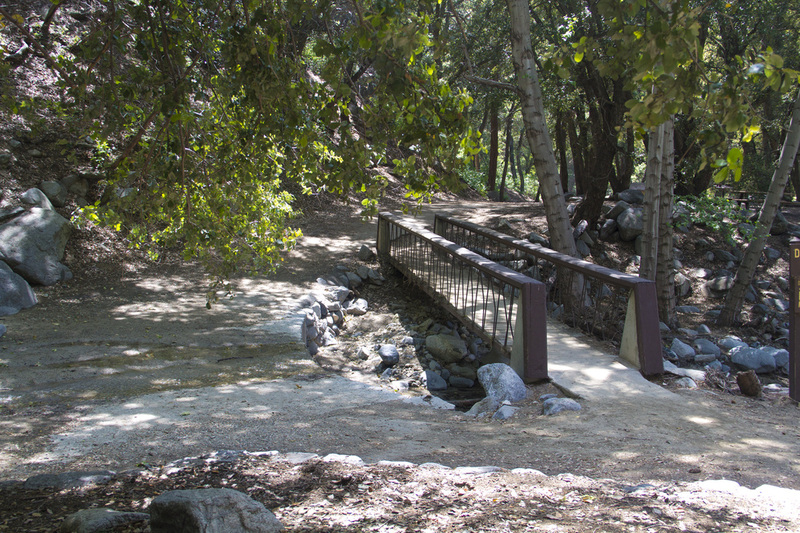 The trail begins in the picnic area at the footbridge that crosses the Arroyo Seco and follows the river downstream, meandering leisurely on a gentle downhill grade through a lush riparian landscape. This portion of the hike follows the Gabrieleno Trail and occasionally crosses the river, necessitating the occasional fording. During drier seasons, the Arroyo Seco is shallow and narrow enough that you can literally step over it without getting your feet wet. During rainy seasons and heavier water flows, you may have to boulder hop your way across more carefully. An Adventure Pass is required to park at this location. Without the pass, you are subject to a ticket and possible towing. Passes are available on the weekends at the Clear Creek Information Center just .4 mile to the west of the Switzer Picnic Area entrance on the Angeles Crest Highway. The center is closed on weekdays, so you will have to purchase a pass prior to making the drive all the way to the picnic area. 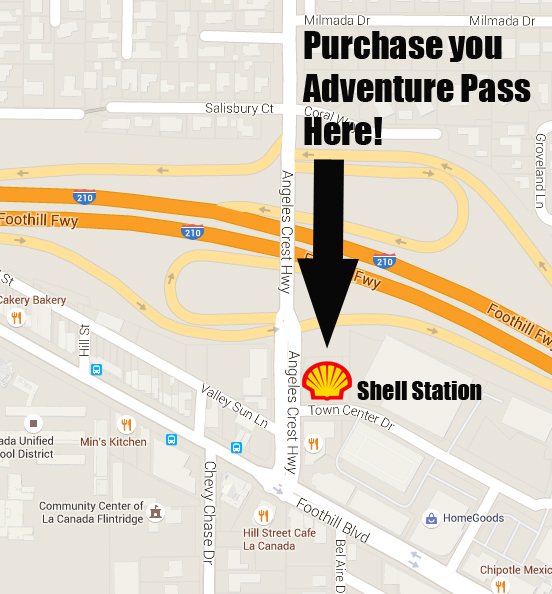 The closest place to purchase a day or season pass during the week is at the Shell Station located at Angeles Crest Highway and Foothill Boulevard in La Cañada Flintridge, just one block from the 210 exit. In 2009, the devastating Station Fire burned large sections of the surrounding landscape, but the waters of the Arroyo Seco acted as a natural buffer and protected the beauty of the canyon floor from the ravages of the inferno. Today, wandering though this enchanted setting for just over a mile, you will see little evidence of the fire that engulfed the area beyond the trees and find yourself far removed from the hustle and bustle of Los Angeles just 30 minutes away. There are, however, occasional reminders of man's past encroachment on this idyllic paradise such as the odd rock wall or retaining feature built along the banks of the Arroyo Seco. At approximately 1.1 miles you will find the largest remnants of man's attempt to tame the wilderness. On the eastern bank of the river are the scattered remains of several wood-burning stoves that marked the site of Switzer-land, a resort camp built during the Great Hiking Era around the turn of the 20th Century. In 1884, Commodore Perry Switzer built a wilderness resort centered around the falls that bear his name. Switzer's camp never had quite the appeal of other resorts in mountains and the Commodore was ultimately forced to sell his mountain retreat. Lloyd Austin purchased the camp in 1912, and he turned the struggling wilderness resort into a thriving destination complete with open-air dance floor, a croquet field, tennis court, and a library. Visitors reached Switzer-land on a 10-mile trip along the Arroyo Seco, which Austin called the Trail of a Thousand Wonders. In 1926, Austin added Christ's Chapel to the precipice 200' above the upper Switzer Falls. 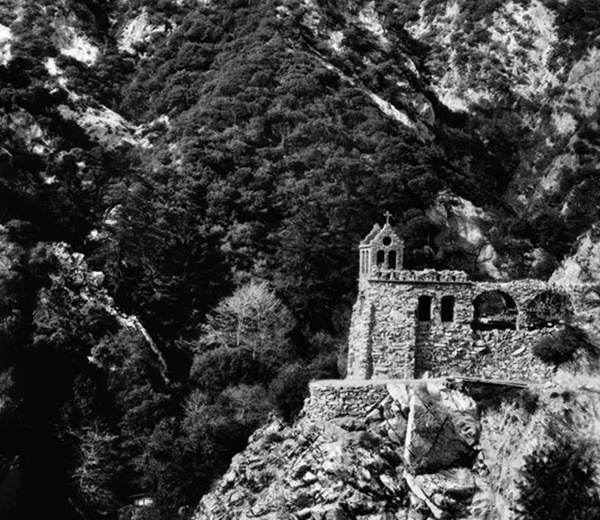 This open-air sanctuary seated 200 people and featured an iron bell, reed organ, and stained glass windows, all of which had to be carried up the canyon from Altadena by hand. Austin and his wife Bertha remained at the camp until his retirement in 1936 when the resort closed for good. As the camp fell into disrepair, the US Forest Service deemed the buildings a safety hazard and they were all destroyed, leaving only the bits and pieces we see today. The chapel was demolished in 1943, but the remains of the stone arches can be seen scattered beneath the pinnacle where the chapel once stood. 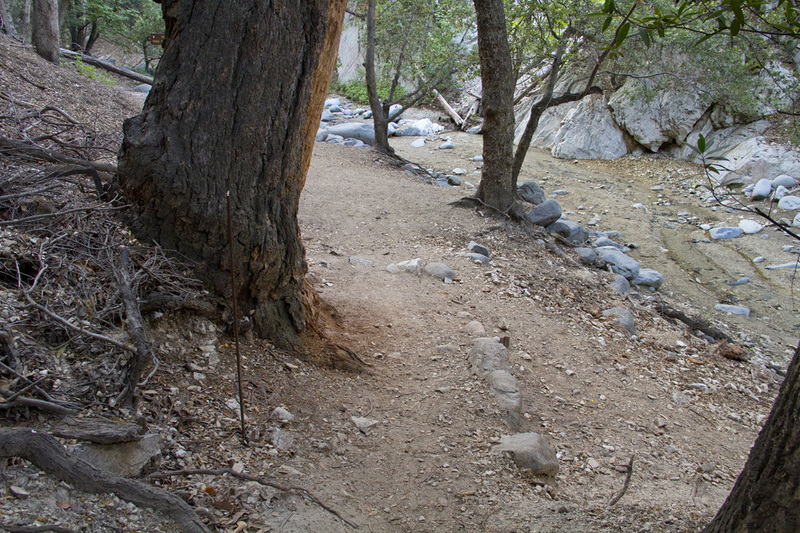 A spur trail exists that allows adventurous hikers to reach the foundations of the chapel and can be accessed by passing through the campsite, keeping the Arroyo Seco on your right. The trip to the remains of the chapel is fairly short, but rather steep, climbing nearly 200' in just a short distance. Though the distance is short, the trail is very tricky to navigate with some particularly nasty vertical climbs. Unless you are particularly adventurous, you may want to forgo this side trip. You may also take a second spur trail from the camp location to the top of the upper falls. From the camp, cross the Arroyo Seco and turn left at the small set of switchbacks built into the hillside and follow the river downstream. As you reach the top of the falls, you'll have to do some rock scrambling, but are rewarded with a nice view of the spill basin below. Do not attempt this trail during periods of heavy water flow. The rocks can be wet and slippery with algae. A misplaced foot or hand could result in a serious tumble over the falls, and that would put a damper on anyone's hike. 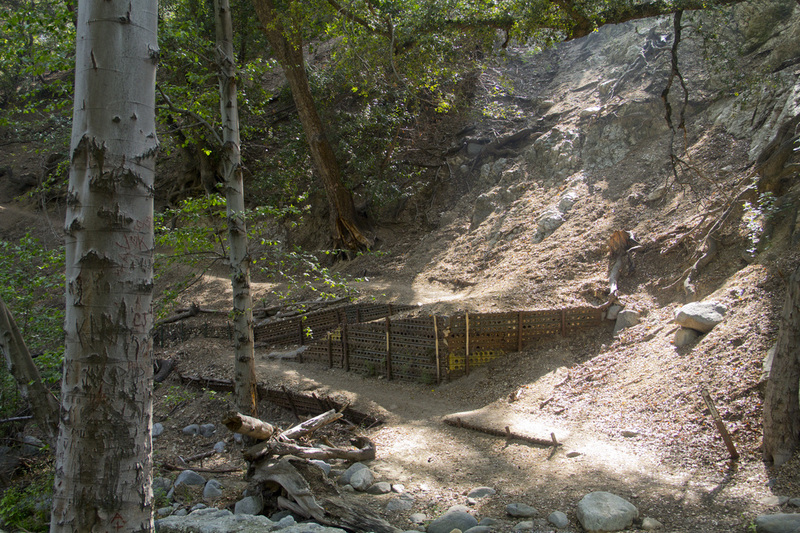 After you've finished exploring this area, return to the site of Switzer's camp and cross the Arroyo Seco toward the small set of switchbacks. 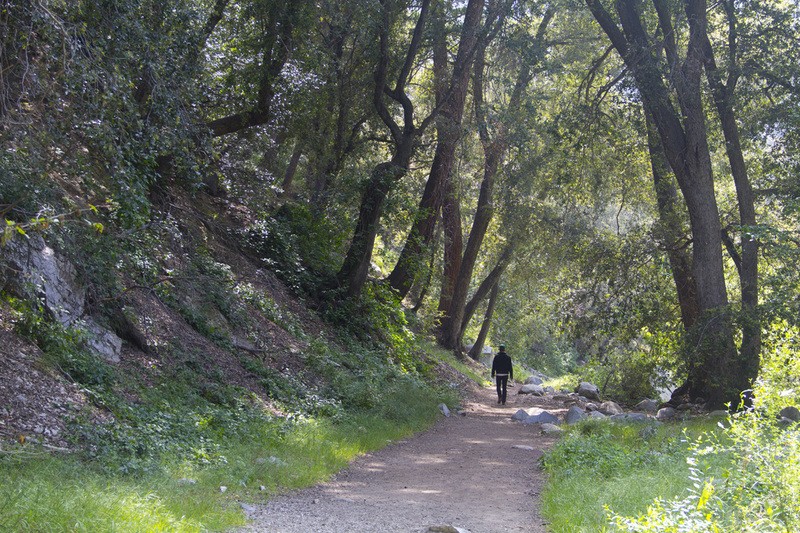 From the switchbacks, the Gabrieleno Trail ascends out of the canyon toward the ridgeline. As the canyon floor falls away, the foliage changes from a riparian to a chaparral environment more typical of Southern California. 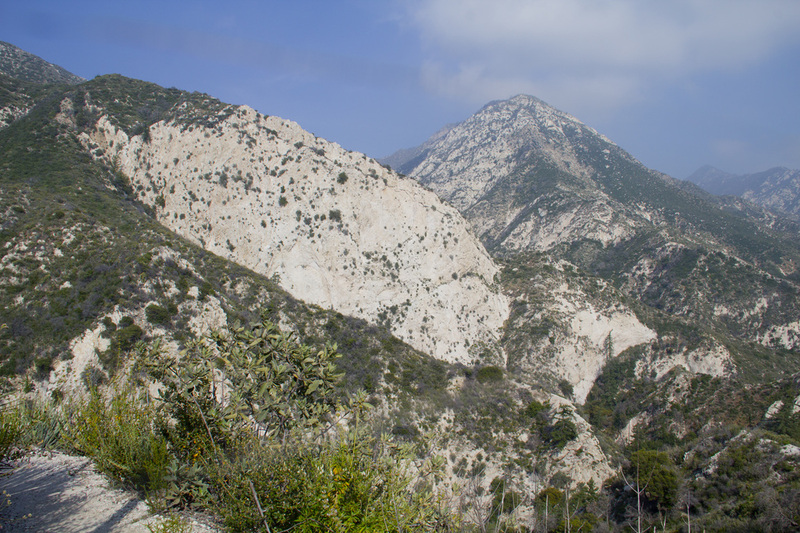 And the views really open up with some long, sweeping vistas of the interior range of the San Gabriel Mountains. As you look up Bear Canyon, you'll be greeted by an impressive perspective of San Gabriel Peak, the tallest summit in the area. Of particular note are the gleaming white faces of the surrounding mountains. These barren faces are the result of the 2009 Station Fire which completely burned away all vegetation from the mountains. With no underlying root structure to hold the earth in place, winds completely stripped the mountains of any remaining soil, exposing the granite substructure. 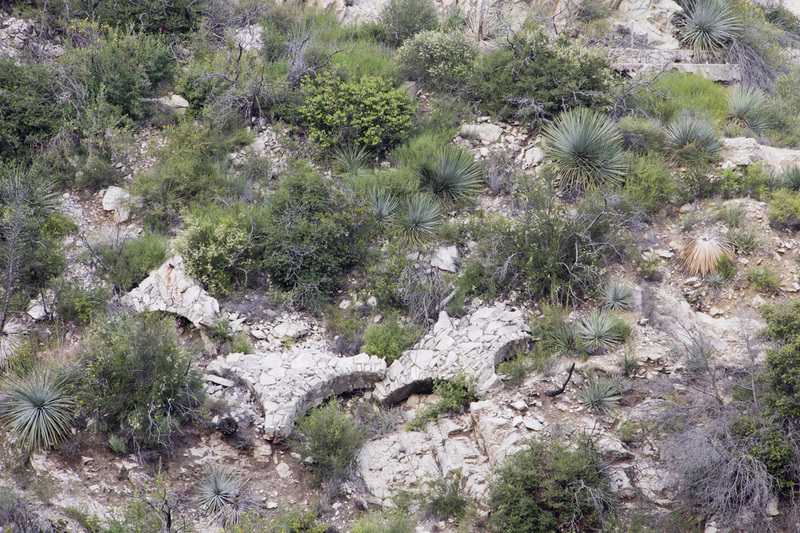 Directly across the canyon are the ruins of Christ's Chapel with the shattered arches of the sanctuary scattered on the cliff face below the chapel's foundation. The trail continues from the switchbacks on the canyon floor for .25 mile up to Trail Junction 1. At the first trail junction, the path splits in two with the Gabrieleno Trail veering uphill and to the right. Switzer Trail descends downhill and to the left. Ignore the trail signage at the junction, as it can be confusing. Simply keep to your left and proceed downhill. From this junction, the trail will narrow considerably and become a rocky, rugged single-track. In about .3 mile, the trail returns you to the canyon floor and the Arryo Seco at Trail Junction 2. Like the first junction, the trail splits again at Trail Junction 2. To the right and downstream is a path into Bear Canyon. To the left and about .1 mile away is the lower cascade of Switzer Falls. The signage here cautions that the remainder of the trail to the falls is not maintained. Fortunately, there is enough traffic to the falls that the trail is easily followed and is a very short distance. If you have any concerns about the trail, just follow the river upstream. The trail ends at the base of the idyllic two-tiered cascade of Lower Switzer Falls. The falls are about 30' in heightl and spill into a circular basin that fills with water during wetter seasons, creating a small wading pool. Unfortunately, due to our on-going drought conditions, the wading pool has dissipated, leaving only a sandy beach in its wake. On the ledge between the tiers, a natural jacuzzi, albeit a cold one, has formed making for a nice place to take a refreshing dip after your hike. Like the lower basin, this bowl may or may not be filled depending on existing drought conditions. While this cataract marks the terminus for most hikers, the more adventurous may want to push on to the larger 50' drop further upstream. To reach the upper falls, look for a spur trail to the right of the lower falls. 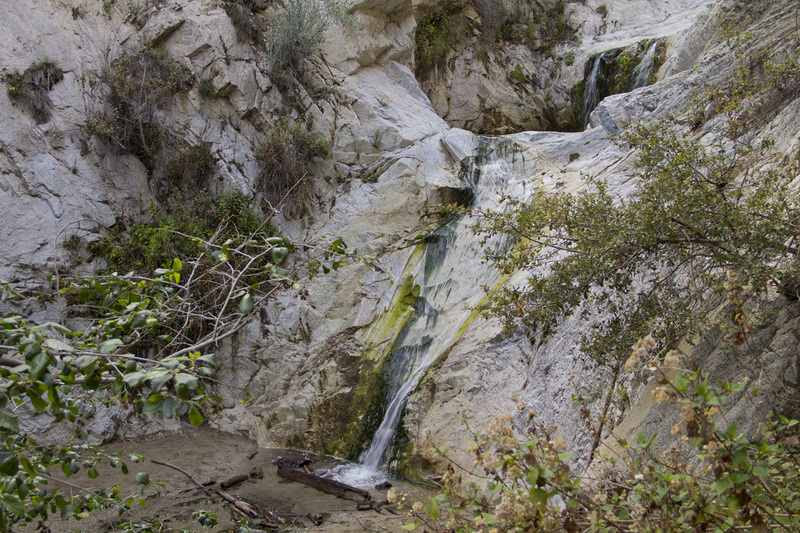 There will be some rock scrambling, ducking under tree limbs and around roots to reach the top of the lower falls, but once there, it is an easy .25 miles trek along the banks of the Arroyo Seco to reach the upper falls. Again, extreme caution is urged if you decide to make this final trek. The rocks surrounding the lower falls are steep and jagged, and may be wet and slippery at any time of year. A slip here could put you over the edge of the falls, and help is a long way away. Hikers who attempt this do so at their own risk. As you move upstream from the lower falls, the trail dead-ends in a box canyon of silver-blue granite walls where the 50' upper falls spill down the cliff face. A larger, deeper wading pool will form in the spill basin in rainy seasons, making for a great swimming hole, but will dry out to a moist sandy beach during dry spells. 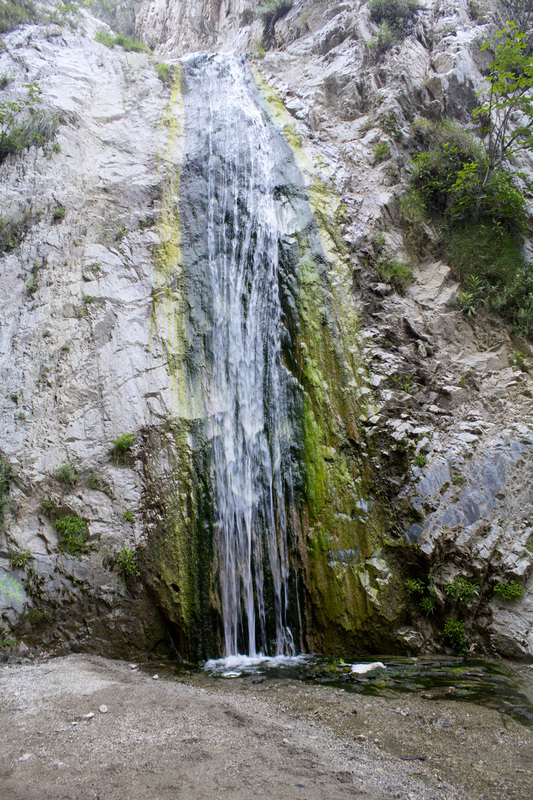 Whether the wading pools are full or not, the falls run pretty much year round, and a trip to Switzer Falls is a delightful journey to one of Los Angeles' most special places. Just don't tell too many people; you'll want to keep this one to yourself. Take the Angeles Crest Highway (CA-2) east for 10 miles from the 210 in La Cañada Flintridge. Just past the Clear Creek Information Center, turn right into the Switzer Campground and Picnic Area. Follow the road all the way down to the parking area. This site does require an Adventure Pass to park. Passes may be purchased at the Clear Creek Information Center on weekends and at the Shell station back in La Cañada Flintridge on weekdays. Do not park without a pass. You may be ticketed and/or towed. Park in the Switzer Picnic Area below the Angeles Crest Highway. ​ park without a pass. You may be ticketed and/or towed. ​ portion of the hike is an easy, gradual descent. 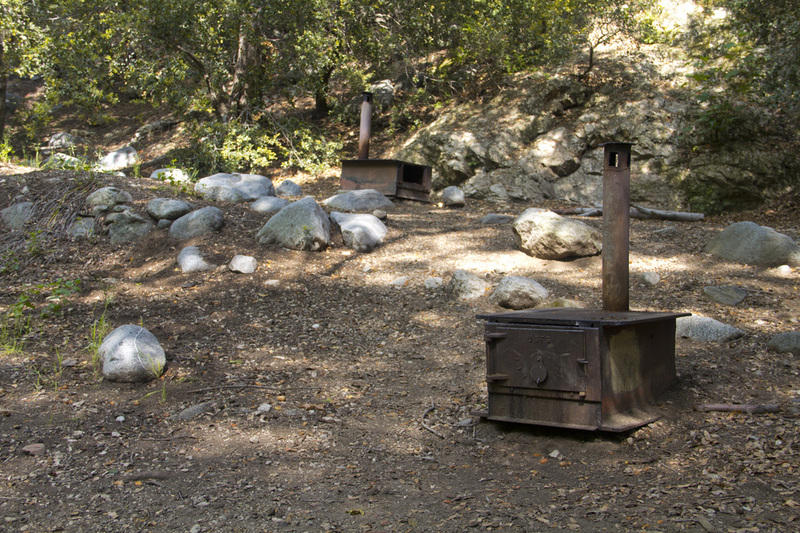 ​ wood-burning stoves scattered along the trail. ​ this side trip should not be attempted. ​ Junction 1, about .25 miles distant. use extreme caution during other times. Trail veers uphill to the right and the Switzer Trail descends to the left. ​ and return to the Arryo Seco in about .3 mile. As you reach the canyon floor, the trail splits to the right and left. onward, the falls see enough traffic that it is fairly easy to follow. ​ Don't be deterred by the sign. ​ makes for a nice natural jacuzzi during the rainy season. granite wall with the Upper Switzer Falls cascading over the face. during rainier seaons, but remains a sandy beach at other times. Hiking to the upper falls is not advised during heavy water flows. ​ Hikers are to use their own discretion. Click any photo below for a larger lightbox image.